Microscopic picture of insulin-producing beta cells from a person with normal kidney function (top) and a patient with chronic renal failure (bottom). The modification of proteins observed in the beta cells (designated by dashed lines) of the patient, known as glycosylation, is responsible for the defect in insulin secretion. Credit: Laboratory of Dr. Vincent Poitout, CRCHUM. According to the article "Urea impairs beta cell glycolysis and insulin secretion in chronic kidney disease" published August 15, 2016 in The Journal of Clinical Investigation. A team from the University of Montreal Hospital Research Centre (CRCHUM) has discovered a novel link between chronic kidney disease and diabetes. When kidneys fail, urea that builds up in the blood can cause diabetes, concludes a study published today in the Journal of Clinical Investigation. "We identified molecular mechanisms that may be responsible for increased blood glucose levels in patients with non-diabetic chronic kidney disease. Our observations in mice and in human samples show that the disease can cause secondary diabetes," said Dr. Vincent Poitout, researcher, CRCHUM Director, and principal investigator of the study. Chronic kidney disease is characterized by the progressive and irreversible loss of kidney function in filtering and eliminating toxins from the blood. Eventually, those affected must undergo dialysis or kidney transplantation to eliminate toxins from their bloodstream. It is well known that type 2 diabetes is one of the causes of chronic kidney disease. The nephrologist Laetitia Koppe, who has just completed a postdoctoral fellow in Dr. Poitout's laboratory, has proven that the opposite is also true. "About half of those affected by chronic kidney disease have abnormal blood sugar levels. I wondered why. We conducted experiments in mice and found impaired insulin secretion from pancreatic beta cells, as observed in diabetes. We observed the same abnormalities in samples of pancreatic cells from patients with chronic kidney disease," explained Dr. Koppe. The researchers highlighted the surprisingly toxic role of urea, a nitrogenous waste product normally filtered by the kidneys and excreted in urine. "In patients with chronic renal failure, the kidneys are no longer able to eliminate toxins. Urea is part of this cocktail of waste that accumulates in the blood. In nephrology textbooks, urea is presented as a harmless product. This study demonstrates the opposite, that urea is directly responsible for impaired insulin secretion in chronic kidney disease," argued Koppe. At the heart of pancreatic beta cells, Drs. Koppe and Poitout identified a particular protein, called phosphofruktokinase 1. "The function of this protein is altered by an increase in blood urea, which occurs in chronic kidney disease. Increased urea causes impaired insulin secretion from the pancreatic beta cells. This creates oxidative stress and excessive glycosylation of phosphofructokinase 1, which causes an imbalance of blood glucose and may progress to diabetes," said Dr. Poitout, who is also professor at the University of Montreal and the Canada Research Chair in Diabetes and Pancreatic Beta-Cell Function. 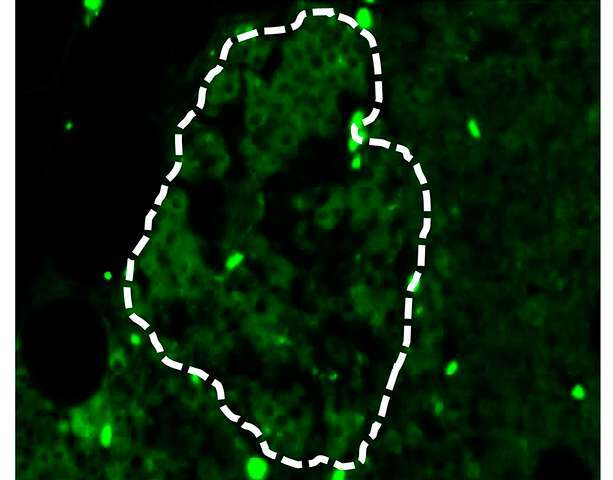 The study is important because it reveals a link and rather novel mechanism between chronic kidney disease and diabetes. "Further studies are required to validate these findings in humans. But if our observations are confirmed, it will mean that patients with non-diabetic chronic kidney disease are at risk of developing diabetes. One might then suggest therapeutic approaches, such as taking antioxidants, which may protect pancreatic beta cells and reduce the risk of developing diabetes," said Dr. Poitout.